Lwaxana Troi escorts members of an extremely telepathic race aboard the Enterprise, where she suffers an intense psychological breakdown caused by a mysterious repressed trauma. Is that little kid Kirsten Dunst? The hooks so far this season have all been duds. There's very little in the opening sequence to get you excited about this episode, just Lwaxana showing up and doing what she's known for (namely, bugging Picard and trying to find a husband for Troi). Have the writers forgotten that you have to draw your audience in on page one? They do a good job with the Cairn dialogue, making it obvious that language is difficult for them but not letting them turn into anything resembling a foreign stereotype. However, I must once again raise the issue of the universal translator. Are the Cairn speaking English, a Betazoid language, or are they just making incoherent noise that the universal translator can decipher? I hate the word "metaconscious," but there is potential in the idea that alien psyches are structured differently, that they percieve and process the world around them in wholly novel ways, psychologically speaking. This is one of those things that should logically be true of all intelligent aliens, but it's a hard concept to realize in science-fiction. I grant that the situations are a little different, but the crew is acting as though "Violations" never happened. Though it seems as though Maques is innocent of any wrongdoing, there is no way to know for sure that his telepathic contact with Lwaxana has nothing to do with her breakdown. By letting Maques use his telepathy on Deanna, Picard is essentially repeating the dumb mistake he made in "Violations," only here it is even worse because he should have learned his lesson. Two episodes in a row dealing with nightmare imagery is a bit much, especially when the dreamy cinematography is nearly identical: long takes, fish-eye lenses, spooky music and lighting, etc. Why does "their house on Betazed" look almost exactly like crew quarters on the Enterprise? In fact, why is so much of Lwaxana's metaconscious on the ship, when Lwaxana has barely spent any time there? The episode would have been more effective had there actually been a different set for the old Troi house instead of just recycling crew quarters and the arboretum. All the water sound effects make me have to pee. Honestly, this was an episode I wasn't looking forward to rewatching, because I have no memories of liking anything about it. However, as with Season Four's Lwaxana episode, "Half a Life," adult eyes make all the difference. I like the idea of the Cairn, of a species that communicates with full, 100% telepathy, and wish there was more time to explore them. Using them to accidentally uncover some deep emotional trauma makes for a fairly ingenious, very human story. As a parent, I understand that having children can make your psyche more fragile, and the fear of something going horribly wrong is pervasive and occasionally intense. 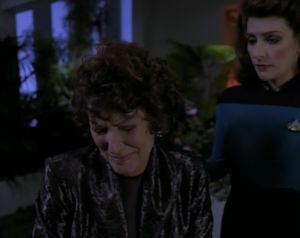 It makes complete sense to me that someone would repress the accidental death of their child out of a sense of shame and regret, and the climactic revelation that this is exactly what happened to Lwaxana is pretty powerful. Having said that, the episode is hurt by being the immediate follow-up to "Phantasms," because really, this is how that episode should have played out: more tonally consistent and emotionally satisfying.